This video is a celebration of the white trout lily (Erythronium albidum) and its various spring ephemeral neighbors. We even talk about the threat that invasive species like garlic mustard (Alliara petiolata). Join us as we go in search of some of the earliest spring ephemerals. In this episode we come face to face with the aptly named harbinger of spring (Erigenia bulbosa) and the lovely Hepatica nobilis. Did you know that there is a naturally occurring white morph of Trillium erectum? I was lucky enough this weekend to find this white one growing right next to its red counterpart. An exciting find indeed! Trillium. The very name is synonymous with spring wherever they grow. Even the non-botanically minded amongst us could probably pick one out of a lineup. This wonderful genus holds such a special place in my heart and I anxiously await their return every year. The journey from seed to flowering plant is an arduous one for a trillium and some may take for granted just how much time has elapsed from the moment the first root pushed through the seed coat to the glorious flowers we admire each spring. The story of a Trillium, like any other plant, starts with a seed. As with many other spring ephemerals, Trilliums belong to that group of plants that utilize ants as seed dispersers. Once underground in an ant midden, a Trillium seed plays the waiting game. Known as double dormancy, their seeds germinate in two phases. 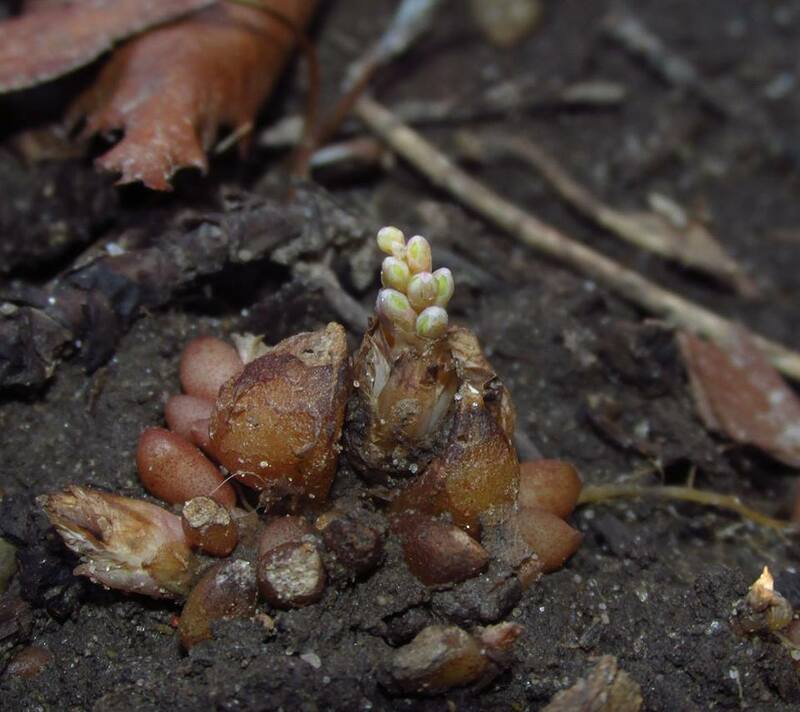 After a year underground, a root will appear followed by an immature rhizome and cotyledon. Here the plant remains, living off of the massive store of sunlight saved up in the endosperm for yet another year. Following this second year underground, the plant will throw up its first leaf. In its fourth year of growth, the Trillium seedling will finally produce the characteristic whorl of 3 leaves we are familiar with. Now the real waiting game begins. Growing for such a short period of time each year and often in shady conditions, Trilliums must bide their time before enough energy is saved up to produce a flower. In an optimal setting, it can take a single Trillium 7 to 8 years to produce a flower. If conditions aren't the best, then it may take upwards of 10 years! Slow and steady wins the race in the genus Trillium. A large population of flowering Trillium could easily be 40 or 50 years old! Sadly, when you couple this slow lifestyle with their undeniable beauty, you begin to spell disaster for wild trillium populations. A plant that takes that long to germinate and flower isn't the most marketable species for most nurseries and, as a result, Trillium are some of the most frequently poached plants in the wild. Because of their slow growth rate, poached populations rarely recover and small plots of land can quickly be cleared of Trilliums by a few greedy people. 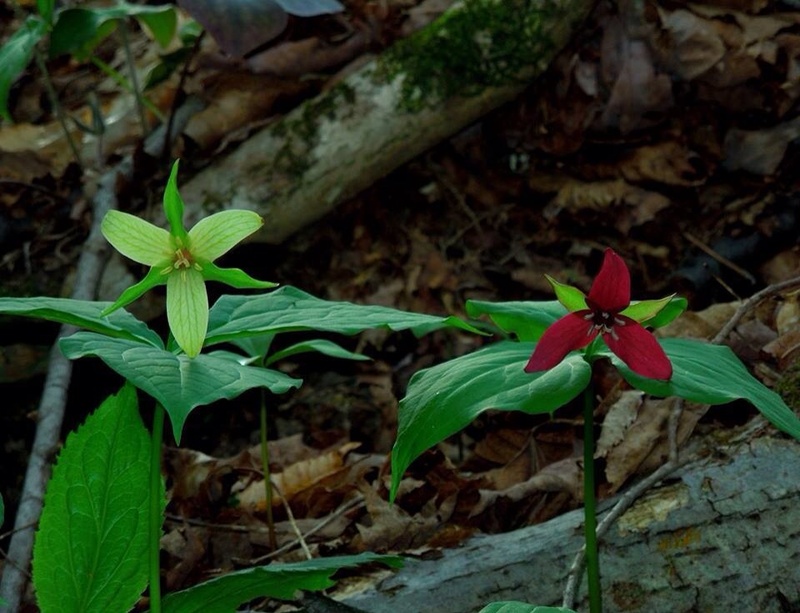 Leave wild Trilliums in the wild! It is officially spring ephemeral season here in western New York! Few plants in temperate horticulture signal the end of winter better than snowdrops. Come February in the northern hemisphere, these herbaceous bulbs begin popping up, often through a layer of snow. They refuse to be beaten back by freak snow storms and deep frosts. Snowdrops are native to a wide swath of the European continent. Like many spring ephemerals, they love moist, rich forests and will often escape into the surrounding environment. Taxonomically speaking, there are something like 20 species currently recognized. From what I can tell, this number has and continues to fluctuate each time someone takes a fresh crack at the group. What is certain is that the original distributions of many species have been clouded by a long history of associating with humans. For instance, whereas Galanthus nivalis is frequently thought of as being native to the UK, records show that it was only first introduced in 1770. Because we find them so endearing, snowdrops have become commonplace in temperate areas around the world. Reproduction for most of the garden escapees occurs mainly by division of their bulbs. As such, most plants you see in gardens and parks are clones. Pollination in snowdrops is frequently quite poor. This has been attributed to the lack of pollinating insects out and about during the cold months in which snowdrops flower. Bumblebees are some of the few insects up early enough to take advantage of their white blooms and, when seed set does occur, the plants rely on ants as their main seed dispersers. Contrary to their ubiquitous presence around the globe, the IUCN lists some snowdrop species as near threatened in their home range. The genus Galanthus contains some of the most heavily collected and traded wild bulbs in the world. Pressure from the horticultural trade coupled with habitat destruction and climate change may push some species to the brink of extirpation throughout Europe in the not-so-distance future. While offering our native pollinators some much needed food resources along with giving us humans a much needed jolt of life after a long and dreary winter, spring ephemerals like these trout lilies (Erythronium americanum), are important nutrient sinks for forests. Back in 1978, a guy by the name of Robert Muller put forth a very intriguing idea known as the vernal-dam hypothesis. Basically, he proposed the idea that soil nutrients are heavily leached into waterways during the spring melt and subsequent rains. Where spring ephemerals are present, they act as nutrient sinks, taking up much of the nutrients that would otherwise be lost. The idea was well liked but unfortunately, the important assumptions of this hypothesis were not tested until the last decade or so. Recently, more attention is being paid to this concept and some research is being published that do indeed support his claims! Though the research does not address whether or not the nutrients really would be lost from the system in the absence of spring ephemerals, it is showing that some species really do serve as nutrient sinks. Trout lily, for instance, is a massive sink for nitrogen and potassium. As they grow they take in more and more. When the warmer summer weather hits and the leaves die back, they then release a lot of nutrients back into soil where vigorously growing plants are ready to take it up. It should be noted that trees will still take in nutrients even before leafing out for the summer. One study even showed that net uptake of nitrogen and potassium by a variety of spring ephemeral species is nearly equal to the net annual losses. I must admit that I did not quite understand what the "losses" are in this particular study but the evidence is tantalizing nonetheless. In one example, nitrogen uptake by ephemerals was 12% of the nitrogen in annual tree litter! Whether or not it is shown that nutrients taken up by ephemerals would otherwise be loss is, in my opinion, beyond the point. What has been demonstrated in the ability of spring ephemeral species to uptake and store vital forest nutrients suggests major ecosystem benefit! Furthermore, when you consider the fact that mycorrhizal fungi are non-specific in most cases and will bond with many different plant species and then go as far as sharing nutrients among the forest flora, you really start to see a big picture story that has been playing out all over the world for millennia. All around northeastern North America, a strange smell is starting to hang in the air. The skunky odor could easily be mistaken for an actual skunk but it isn't quite that strong. Some say garlic is a more apt description. If you are in a wet area you may notice small chimneys in the snow or what looks like a red and yellow parrot beak poking up from the ground. The smell gets stronger as you bend down to get a closer look. What you are seeing is Symplocarpus foetidus, better known as eastern skunk cabbage. Skunk cabbage is a true spring wildflower. It is also one of those small groups of plants that can generate their own heat. This aroid can literally melt its way through the snow cover. Skunk cabbage hails from the same family of plants as the titan arum, Araceae. The inflorescence emerges in early spring, oten before the snow (if there is any) has had a chance to melt. Using heat generated via a unique form of metabolic activity, the inflorescence can reach temperatures of 15-25°C (59-77°F). So, why the heat and smell? Well, if you like to bloom before the snow melts, you better hope you can at least melt through some of it. In deeper areas, skunk cabbage flowers create chimneys in the snow, which helps channel the scent up into the air. Though it may seem surprising, there are in fact insects out and about during the early days of spring. The smell attracts pollinators such as carrion flies and gnats. The heat also aids in volatilizing the odor, thus causing it to spread out farther. By blooming this early, skunk cabbage assures that its flowers get a majority of the attention. After flowering is finished, the plant then throws up its large, green, elephant ear leaves. They are unmistakable. As the plant continues to grow throughout the season, its roots contract into the soil, digging the plant deeper and deeper. In effect, skunk cabbage grows down, not up. This is advantageous if you live in an area prone to flooding. The deeper you go, the harder it is to get pulled out. I love this plant. It is wonderful to see its blooms poking up from underneath the snow. After so many months of drab colors and short days, this harbinger of spring is a breath of fresh, albeit stinky, air.